Description: At age 89, Hank Jones is playing as well as any point in his long, celebrated career. He is still constantly challenging himself, teaming up with younger musicians, performing and recording new materials. His Great Jazz Trio, which was born in 1975 with Tony Williams and Ron Carter, has undergone numerous personnel changes, and the latest, 21st century iteration includes John Patitucci and Omar Hakim. Hakim is generally known as a fusion/contemporary drummer, but unexpected chemical reaction of seemingly incompatible elements has been the hallmark of the Great Jazz Trio from its beginning. Their latest releases are wonderful twin CDs recorded live this year at Birdland, New York. Each CD, simply titled July 5th and July 6th, respectively, contains nine tunes that Jones had never recorded before. His piano playing is elegant, fresh and inventive. 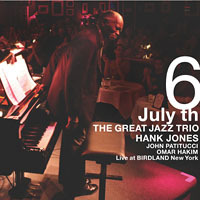 Patitucci aids with superb musicality, and Hakim with impeccable comping and explosive solos. Last but not least, these hybrid SACDs sound phenomenal. Recorded in 24-channel, pure DSD with a mobile recording unit and mixed and mastered in Tokyo at Sony Studios, they are one of the most realistic, natural sounding live recordings I've heard, and reference quality discs for audiophiles. Turn up the volume way up, and you'll feel as if the musicians are in your room! Highly recommended. Recorded live at Birdland, New York, on July 6, 2007. Pure DSD Recording. This Hybrid SACD contains a stereo SACD layer, a five channel SACD layer and a stereo CD layer. It plays on any regular CD player as well as on SACD players.